The new global OTC derivatives trading framework requires more transparency and higher standards. But, the timeframe to fully understand and implement changes is compressed. At Euroclear we understand that your first priority is compliance on a scalable, cost-effective basis. Our existing collateral management solutions and global network are already helping banks to manage their derivative exposures across market segments. Why is the industry turning to us? Our OTC derivatives margin and collateral management solutions offer protection, control and functionality according to your needs, priorities and resources. With us, you are also compliant with the BCBS and IOSCO mandatory collateral segregation and control requirements. Looking to settle and segregate your assets on a bilateral basis as margin for non-centrally cleared derivatives transactions? We can hold collateral in a segregated account as a neutral third-party pledge holder. 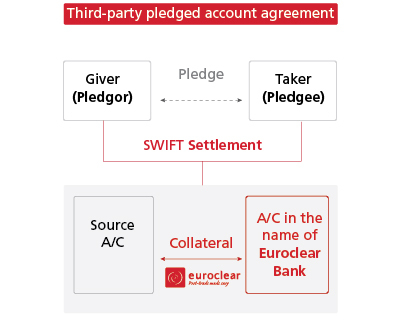 This means assets cannot be used for any other purposes by the pledgee and can only leave the account by returning to the pledgor. Settlement takes place in a Securities Settlement System using standard SWIFT settlement messages and standard settlement reporting. The collateral is securely ring-fenced in-line with regulatory requirements and is serviced by a neutral party (not a custodian acting on behalf of a counterparty). Looking to settle and segregate your assets on a bilateral basis as margin for non-centrally cleared derivatives transactions as well as margin and collateral allocation monitoring, reporting and support? 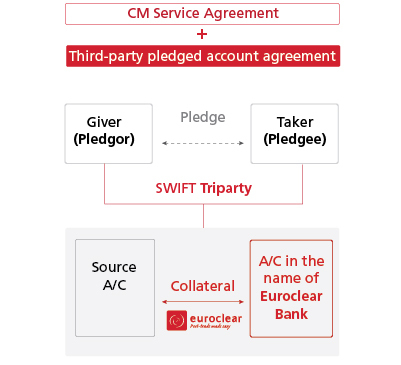 Our segregated triparty solution gives you access to both a neutral third-party pledge holder and neutral collateral agent. This solution provides segregation, control and additional levels of collateral optimisation for efficient mobilisation of assets (including allocation and substitution), using standard triparty instruction messaging (SWIFT MT 527), monitoring and reporting. The solution provides for the orderly management in the event of a default.